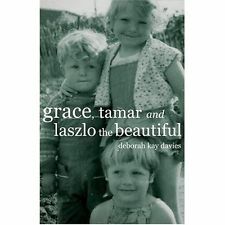 Grace, Tamar and Laszlo the Beautiful, the 2009 Wales Book of the Year, is officially listed as a book of short stories by the acclaimed Welsh author Deborah Kay Davies, but it is much, much more than that. In fact, I struggle to use the term “book of short stories” because the connection of the stories featuring the sisters Grace and Tamar is so tight and integrated that I am inclined to call it a novel. This is a mature and powerful work of art intended for adult readers. The first story, “Stirrups,” actually begins with their mother on the event of Tamar’s birth, showing how the woman’s fragile mind tries to deal with the baby girl who is Grace’s younger sister by two years. She struggles to give her love to more than one person at a time, missing Grace and wondering if she can ever relate to this new child. The next story, “Point,” finds Grace at the age of six already somewhat ethereal and hating her four year old sister, Tamar, for being so feral. It is a relationship newly formed, but one that will be a part of their lives until they are adults. From one story to the next, told in chronological order, the relationship between the two sisters dominates the book as the point of view weaves back and forth. As a child, Tamar spends most of her time alone, creating strange games for herself, becoming fascinated with the weird neighbors, pushing her sister Grace to exasperation. Grace lives in a world where she was the only child. She can barely stand Tamar, yet there is a bond between them that is extremely tight. Grace pushes Tamar from a tree, Tamar beats on Grace, they push each other back and forth and stand united in only two things: first, their amusement that their mother seems to be going insane (“Radio Baby” is a powerful reminder that their mother’s hold on reality is tenuous at best) and second, the great common dream that they share of being together as adults with their own baby. There is a stark parallel to Grace’s retreat from the world and Tamar’s reach to embrace it. The importance of Tamar’s dream of the baby comes full circle in the final story, “Cords,” a taut, emotional reach between the two adult sister. The writing throughout is beautiful, a real pleasure to read. Lean and well-constructed, the stories are each absolutely compelling portraits of two sisters adrift in the world. The sentences are spare, concerned only with what is most important. Sometimes they drift, like the sisters, but they drift with a singular intensity that always reaches back to the heart of the book. And that’s really what makes me think of this is a novel. In a novel, one looks to see a compelling story arc, from one place to another from the beginning to the end, with an integrated theme throughout the book. Even though Grace, Tamar and Laszlo the Beautiful jerks from one story to another, I see a very powerful, overarching story arc that binds the stories together into one, long cohesive tale that stands up to the highest scrutiny. The jacket contains the following epithet: “moving, hilarious and terrifying.” I found the book to be less hilarious and more moving, but, yes, at times it is also terrifying. I found it to be one of the more emotionally disturbing and satisfying books that I’ve read over the last twenty years. The combination of such beautiful, powerful writing with such original, distinctive characters is quite unusual. In fact, after I finished reading the book, I found myself drawn back to one story or another just to lose myself in the prose. I haven’t had that feeling since I first read Salman Rushdie. This is a great book that I highly recommend to all adult readers.